Preserves are one of the great ways to enjoy a seasonal fruit like strawberries all year round. Preserves tend to be more fruit-heavy than jams or jellies since they contain chunks of the fruit throughout. Because of this, preserves generally contain less added sugar. 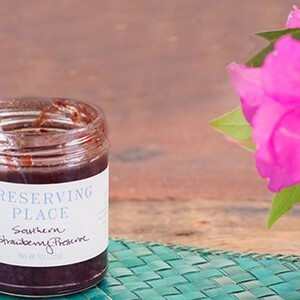 Preserving Place's strawberry preserves are made using local, organic spring strawberries. Sugar acts as a preservation agent when cooked down with the fruit- this is why jarred or canned preserves last much longer than the flat or strawberries you bought from the farm. The preservation method keeps the sweet strawberry flavor long after spring has sprung. Strawberry preserves are great spread on a slice of toast, served with afternoon tea, or baked in a tart or a pie. You can enjoy strawberry preserves anytime when you add a Strawberry Tartlet with Chevre and Vanilla Sugar (available in our Store) to your PeachDish box.